In a statement, Sony said the albums had been "mistakenly mispriced". It added the error was "immediately corrected" once it had been discovered. Houston fans had taken to Twitter describing the price hike as "greedy" and "shameful". Since Houston's death aged 48, her record sales have seen a major boost in the US and the UK. Several of her songs are on course to re-enter the UK singles top 40 on Sunday with a greatest hits compilation heading for the top 10. Houston's cover of the Dolly Parton single, I Will Always Love You, is likely to reach the top 10 on Sunday. The single, which featured in The Bodyguard, previously spent 10 weeks at number one and was the biggest selling single of 1992. Meanwhile, details of the singer's funeral have been announced. 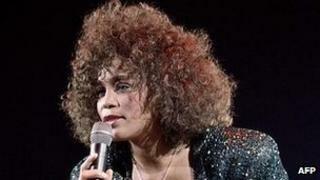 She will be laid to rest during a private ceremony on 18 February in the New Jersey church where she sang as a child. No plans for a public memorial service have been announced. Funeral home owner Carolyn Whigham said: "The family thanks all the fans, the friends and the media, but this time is their private time." Gospel singer and Grammy award-winner Marvin Winans will give the eulogy. Winans, who is also a pastor, married Houston and fellow singer Bobby Brown in 1992. "The loss, you can't place into words because it's like your sister," he told US TV network ABC. "She became the sweetheart of America and it's hard to live up to those expectations." The singer was discovered in a bath at a hotel in Beverly Hills. A post mortem is yet to determine the cause of her death. Her body has since been flown to New Jersey and was driven to the funeral home in a gold hearse.